One young woman poses with Fallout’s Vault Boy, mascot of the Vault-Tech corporation in the Fallout gaming universe during the Mothman Festival. Bethesda Game Studios representatives interact with Mothman Festival visitors in September in downtown Point Pleasant. OHIO VALLEY — The Fallout® 76 vault has officially opened and it’s putting one local town on its map and before the eyes of video gamers everywhere. The West Virginia Tourism Office this week celebrated the worldwide launch of Bethesda Softworks’ video game Fallout® 76, the latest edition of its blockbuster game series in which players explore different parts of a post-apocalyptic America. Point Pleasant is one of the locations featured, including the Mothman Museum and of course, the Mothman also swoops in to make his presence known. 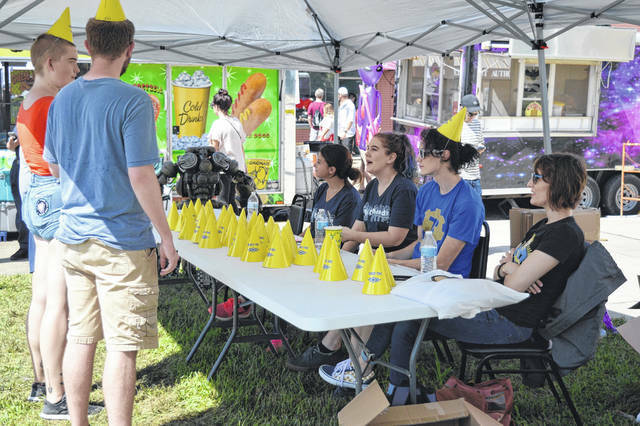 Representatives from Bethesda were at this year’s Mothman Festival in Point Pleasant. When the Mothman Museum caught wind that its favorite legend would be featured in the game, it reached out to Bethesda Game Studios and asked them to participate in the Mothman Festival where Ohio Valley Publishing Reporter Dean Wright caught up with Bethesda staff. Finster described the contact with the Mothman Museum as a nice coincidence. The West Virginia Tourism Office announced a formal agreement with Bethesda last month and marked the official game launch, called “Reclamation Day,” with an interactive game map and launch celebration at the State Capitol. The West Virginia edition is the company’s most ambitious game universe to date, covering a much larger geographical area than ever before and playing up local West Virginia lore. Previous editions in the Fallout® series were set in Washington, D.C., and Boston. The game will offer many loyal fans their first glimpse of West Virginia, creating a unique opportunity to promote tourism to a new audience. The Tourism Office has been working behind the scenes with the award-winning game developer to devise a promotional strategy that capitalizes on interest from the game to drive visitation to the state. An exclusive interactive map of all real-life West Virginia locations in the game launched today on WVtourism.com to coincide with the official game release. The map holds the official list of sites and allows visitors to explore online, sharing facts and information about each location along the way. “Folks have been speculating for months about which West Virginia landmarks would be in the game, and today, we were able to release the full list. With Bethesda’s help, we’ve developed an interactive map that shows which sites in the game are based on real-life West Virginia attractions. The early response has been incredible. Within an hour of that map going live, we had thousands of gamers on the West Virginia tourism website learning about the real attractions,” Ruby continued. Other locations which made it into the game were New River Gordge Bridge, Camden Park, Trans-Allegheny Lunatic Asylum, Harpers Ferry, Pumpkin House, Morgantown, Spruce Knob, Seneca Rocks and more. Dean Wright and the West Virginia Tourism Office contributed to this report. 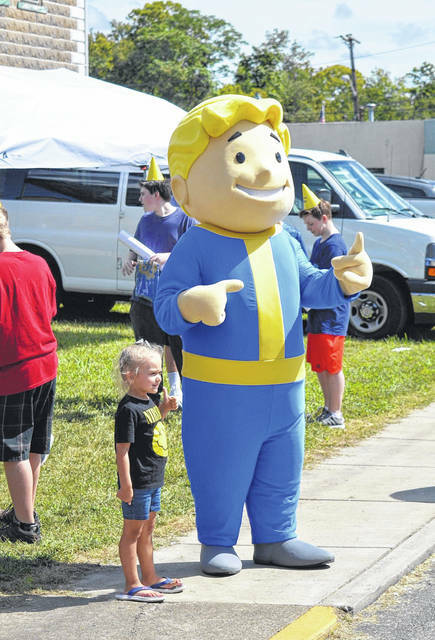 https://www.mydailytribune.com/wp-content/uploads/sites/42/2018/11/web1_DSC_0104.jpgOne young woman poses with Fallout’s Vault Boy, mascot of the Vault-Tech corporation in the Fallout gaming universe during the Mothman Festival. https://www.mydailytribune.com/wp-content/uploads/sites/42/2018/11/web1_DSC_0108.jpgBethesda Game Studios representatives interact with Mothman Festival visitors in September in downtown Point Pleasant.